One of the things I've been stumped by in researching whole-grain recipes is deciding what comprises a whole-grain dish. Obviously a bowl of brown rice is a bowl of whole grains, but risotto consisting mostly of arborio with a half-cup of barley thrown into the mix is not. To my reasoning, a recipe for cornbread that calls for all-purpose flour is not a  whole-grain bread, though it includes a whole grain: cornmeal. But a cornbread recipe that is half cornmeal and half whole-wheat pastry flour is a whole-grain bread because all the grains used are whole, not refined. 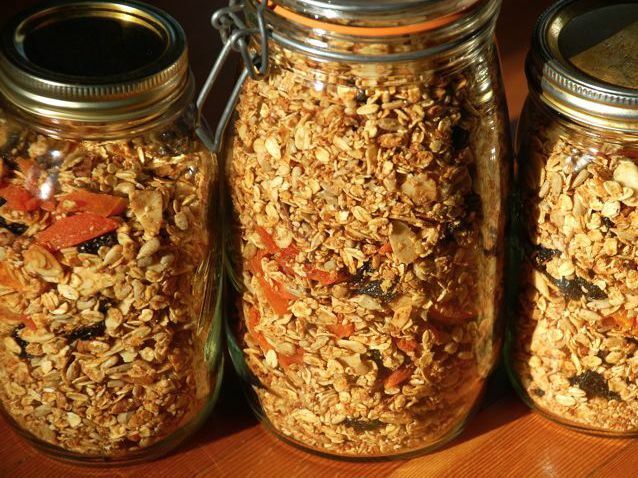 [%image reference-image width=300 float=right caption="Homemade granola."] I'm challenged, though, when it comes to baking, because usually I don't like the dense texture of pastries and cakes made exclusively with whole grains. On the other hand, to eat a baked good made only with white flour — except for the occasional treat — seems like a missed opportunity. When it comes to the grain recipes we've culled on Culinate — the Whole Grains collection — the criteria are these: at least half the grain or flour called for in a recipe must be a whole grain, or the recipe must specify in the Introduction or Notes how to work in more whole grains. The recipes in this collection come from Culinate contributors, cookbooks on the site, and our own busy kitchens.